Have you ever wondered just how much space you’re taking up on your system and network hard drives? Disk Savvy is an application that makes it so that you don’t have to wonder anymore. Once your local and/or network storage drives have been analyzed, the program offers you complete and accurate reports on everything it found. What makes Disk Savvy different from some similar programs is that it gives you the opportunity to create custom profiles which can in turn be used to run personalized scans. With Disk Savvy at your fingertips, you’re guaranteed a fast, accurate, and efficient analysis every time. 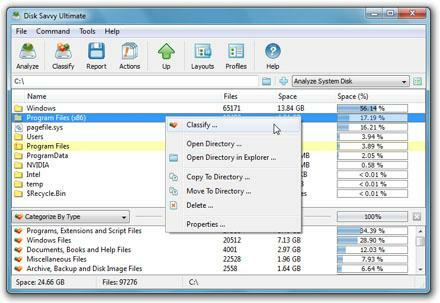 - Enables you to perform a detailed analysis on local and network attached storage drives quickly and easily. - Presents you with accurate information after an analysis that includes a variety of information (the number of files, the amount of space they take up, etc.). - Lets you run a full scan or opt for an isolated one instead. - Is able to categorize your files for you if you’d like (by extension, size, creation time, modification date and/or time, etc.). - Gives you the opportunity to create custom profiles which you can use to run personalized scans (each profile can be modified at any time). - Can generate and save your reports for you to ensure that you’re able to quickly pull them of for reference whenever you need to (in TXT, CSV, XML, HTML, or PDF format). - 500 MHz or better CPU. - 256 MB or more RAM. - At least 25 MB of free disk space. - File Matching Rules and Performance Modes are available in Pro version only. Create HTML, text or CSV directory listings.